The reasons behind the 'crash' include consumers tightening their purses, waiting for the year end to pass and not looking to loans as lending norms tighten. 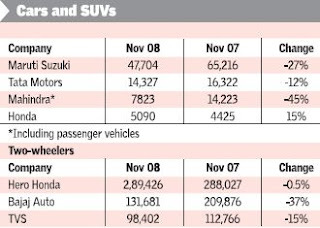 Almost all car and bike manufacturers have been affected. The one most hit, amongst car brands, is Mahindra Logan which had sales of 300 units in November compared to 1500 units in November, 2007. Wonder if its partly got to do with households shying away from the brand, as its now perceived more as a 'cab'? Me thinks so. Am Glad to see you here Sir. Your posts are great in terms of knowledge and writing! I have added your journal in my Blogroll. Thank you...for the comments and the Blogroll addition. I remain cautiously bullish on India over medium-long term. Short term there would be volatile movements in markets till May/June 2009. Technically Nifty 1975 looks a Bear Bottom to me. Money like water will finds its way, if India recovers from temporary slowdown, new money is bound to come to equities! Being in Debt now would give 'short term safety but long term pains', whereas starting to invest in Equity may give 'short term pains but long term gains'. Returns immediately after a bear market has been historically much higher than average returns in Equities. This leads me to believe that Equity allocation in 2009 spread over 6 months (Jan-June 2009) would most likely outperform all other asset class returns on 2-3+ year horizon.